Noreva Exfoliac Global 6 Corrective and Unclogging Imperfections Care exfoliates, soothes and reduces marks in case of severe imperfections. 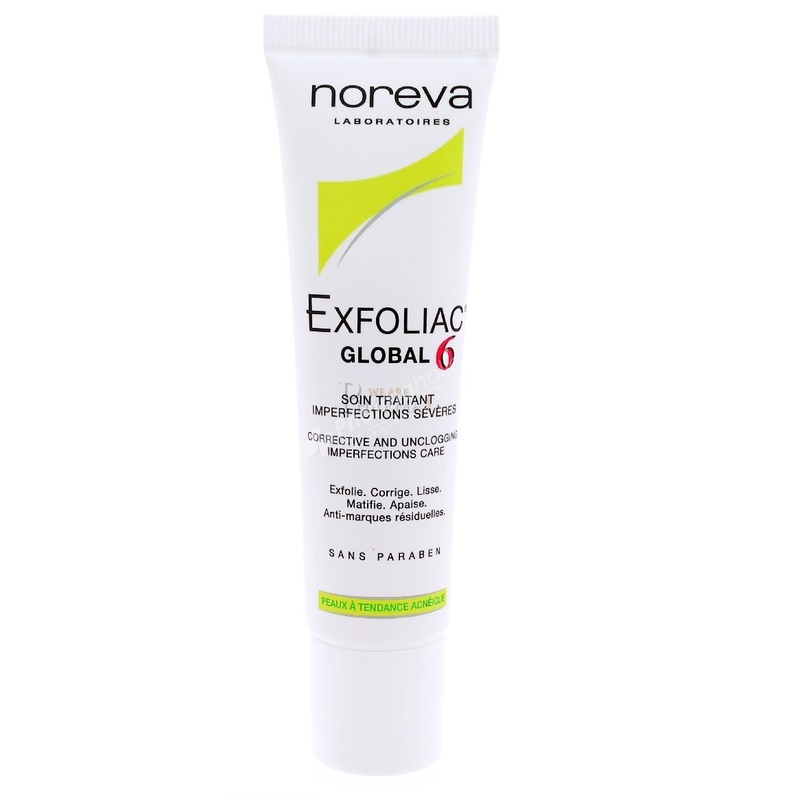 The care contractor Global Exfoliac 6 of Noreva is an anti-blemish cream with 6 actions: exfoliate, correct, smooth, matte, soothe and reduce residual marks in case of severe imperfections . It is particularly suitable for acne-prone skin. Noreva Exfoliac Global 6 Treatment Care is composed of Lipobactol phytobioactif to act on the bacteria responsible for blemishes and blemished pimples (P. Acnes among others), to regulate sebaceous secretion (sebum) and to avoid the appearance of residual traces post- acne (acne scars). Paraben-free, this global Exfoliac 6 treatment also contains Hyaluronic Acid 300 to promote immune defenses by stimulating ßdefensins and thus activate skin repair. Apply the Noreva Exfoliac Global 6 treatment morning and evening on the entire face previously cleaned with Exfoliac Purifying Gel. Aqua (Water), Isoamyl Cocoate, Silica, Starch Hydrolyzed Corn, Steareth-2, Steareth-21, Salicylic Acid, Cetearyl Alcohol, Cocamidopropyl Dimethylamine, Bakuchiol, Dimethicone, Hydroxypropyl Starch Posphate, Hydroxyehtylcellulose, Perfume (Fragrance), Benzyl Alcohol, Sodium Hydroxide, Xanthan Gum, Chlorphenesin, Disoidum Edta, Hydrolyzed Hyaluronic Acid, Butylene Glycol, Polyquaternium-67, Hydrated Silica, Hexyl Cinnamal, Linalool, Butylphenyl, Methylpropional, Glycerin, Sorbic Acid, Benzyl Salicylate, Citronellol, Alpha-Isomethyl Ionone, 10- Hydroxydecanoic Acid, Sebacid Acid 1,10-Decanediol, Eugenol.